It is well established that Schroeder diffusers may be used as surface treatment to promote diffuse sound fields in auditoria over a target frequency range. Quadratic Residue Diffusers are very effective within a design frequency bandwidth, and this frequency bandwidth may be significantly extended by a nested or fractal design. Publicly available data typically publishes diffusion coefficients separately for the parent diffuser and the child diffuser, with some ambiguity surrounding the effect the two levels have on each other, and the performance at 'crossover' frequencies. 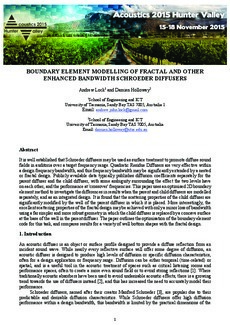 This paper uses an optimised 2D boundary element method to investigate the differences in results when the parent and child diffusers are modelled separately, and as an integrated design. It is found that the scattering properties of the child diffuser are significantly modified by the well of the parent diffuser in which it is placed. More interestingly, the excellent scattering properties of the fractal design may be achieved with only a minor loss of bandwidth using a far simpler and more robust geometry in which the child diffuser is replaced by a concave surface at the base of the well in the parent diffuser. The paper outlines the optimisation of the boundary element code for this task, and compares results for a variety of well bottom shapes with the fractal design.